Whatever happened to Officer Friendly? You may recall that program, designed to improve police-community relations by acquainting children and young adults with law enforcement officers and explaining to them that police were their friends and were there to help. It was popular in the 1960s, but largely died out by the 1980s, although vestiges remain at a few police departments scattered around the country. There may still be a smiling Officer Friendly on the force somewhere these days, but you wouldn't know it, because he's all dressed up in paramilitary gear, looking like an Imperial Storm Trooper, and that smiling face (if it exists at all) is hidden behind the darkened visor of his riot helmet. Written by veteran investigative journalist Radley Balko, who's been covering the drug war, policing, and criminal justice beat for years at places like Reason magazine, the Cato Institute and Huffington Post, Rise of the Warrior Cop explains what happened. It's a long story whose origins go back to colonial days, but in Balko's hands, an entertaining and illuminating story -- as well as depressing and frightening -- told with verve and gusto, meticulously researched, and filled with telling historical detail. Balko traces the origins of policing back to the colonies and exposes the tension between fears of a standing army and the need for an effective force to maintain public order. He shows how the values (and fears) of the Founding Fathers were expressed both in the Castle Doctrine ("a man's home is his castle") and the Bill of Rights, whose 3rd Amendment forbade the stationing of troops in private homes in peacetime and whose Fourth Amendment protected persons and their homes from government intrusion without a warrant. Balko's telescoping work brings us rapidly to the dawn of the contemporary period a half-century ago, when rising crime rates and social disorder sparked heightened public concern and increased willingness by the public and the men in blue to resort to ever more repressive and aggressive policing measures to stem the tide of anarchy unleashed by pot-smoking hippies, anti-war activists, and uppity blacks. And if you want to put a face on the militarization of American policing, Balko has just the man for you: former LAPD Chief Darryl Gates, advocate of professionalized law enforcement, creator of the first SWAT team and proponent of harsh measures against drug users -- he told Congress they should be executed. Gates was first out of the blocks with SWAT, but in the years since then, SWAT teams popped up first in other big cities, then in medium-sized cities, and then in smaller towns and cities across the country. Originally designed to be used in rare situations involving the need for special weapons and tactics (Special Weapons And Tactics, SWAT), such as riots like the one that swept Los Angeles in 1965 and hostage situations, such as the shootout involving the Symbionese Liberation Army, the group who kidnapped Patty Hearst, in 1974, Balko details how SWAT has undergone "mission creep." From being used rarely and only in the most extreme circumstances in the beginning, SWAT teams now are deployed dozens of times a day, tens of thousands of times a year, and are routinely used against low-level, nonviolent drug offenders. The application of such aggressive policing gets people killed, including both cops and innocent citizens, as well as criminals. As he guides the reader through recent history, we revisit ugly scenes that regular Chronicle readers may recall, and some that many have doubtless never heard of. The litany of needless deaths because of law enforcement overkill is infuriating -- and terrifying. Of course, police alone did not militarize themselves. Politicians, especially those trying to win votes playing the "law and order" card, encouraged, enabled, and emboldened police. And, as Balko brilliantly shows, the imperatives of the drug war were a key motivator for political leaders like Richard Nixon, Ronald Reagan, and George Bush the Elder, all of whom expanded and deepened the war on drug users and sellers largely for political gain. The flip-side of the undeniable militarization of American policing is the steady erosion of the Castle Doctrine and the Fourth Amendment. Balko does a real service by detailing a line of Supreme Court decisions dating back decades, but really beginning to bite in the past 30 years, that successively eroded Fourth Amendment protections. While aimed, of course, at only the worst criminals, the loss of those protections is suffered by all of us. It really seems like America is degenerating into a variety of police state, with peaceful demonstrators confronted by police riot squads, "no-knock" raids that seem more in place in a war zone than in an American city, a cornucopia of federal dollars and surplus military equipment turning every Barney Fife into Robocop. In addition to the imperatives of the drug war, police militarization has only been heightened by our now more than decade-long War on Terror. But Balko sees some hopeful signs. He credits the rise of social media for casting a glaring light on police abuses and ensuring that the evidence is widely circulated. He notes that enthusiasm for the drug war is lagging and skepticism about government is growing. And he charts the beginnings of a path back to an America where the police are peace officers. "The best reform to scale back the overly militarized, dangerously civil-liberties averse style of policing that prevails in this country would be to end the drug war all together," he writes, while acknowledging that's not very likely. But barring the end of drug prohibition, the federal government could at least end the federal drug war and the federal incentives to militarized policing. No more federal taxpayer dollars for local police funding, no more Byrne Grants to fund those cowboy drug task forces, no more surplus military equipment to turn local police into occupying armies (at least in certain neighborhoods). Beyond that, local officials can work to halt the "mission creep" that has seen SWAT go from riots and hostage situations to raiding poker games and bars serving underage drinkers, or doing "administrative searches" of unlicensed barbers, as happened in Miami. And does the Department of Education really need its own SWAT team? And, as Maryland did after the infamous SWAT raid on Berwyn Heights Mayor Cheye Calvo, states can start demanding transparency and accountability from police commanders in the way they deploy such specialized units. 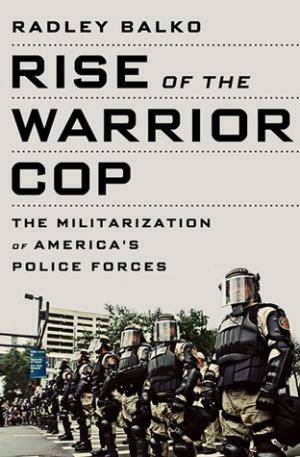 Rise of the Warrior Cop is an important book and deserves to be read by small government conservatives, civil libertarian liberals, police commanders, and politicians alike. Balko makes a very strong case that the status quo is a threat not only to our liberties and our way of life, but to the very values on which the country was founded. After reading Rise of the Warrior Cop, I'm in a bad mood. Some of the people responsible for this militarization of our police, like Darryl Gates, Richard Nixon, and Ronald Reagan are already burning in hell where they belong. Others, like Bush the Elder drug czar Bill Bennett, who also called for the death of drug users, civil liberties be damned, are not there yet, but deserve to be. Still others, like Joe Biden and a majority of the Supreme Court, are currently serving in some of the highest offices of the land. I guess I better not say what I think of them. I don't want to be visited by a SWAT team.